Before defeating your enemy, it’s important to understand your enemy! Most people confuse mildew and mold but they’re very different threats. 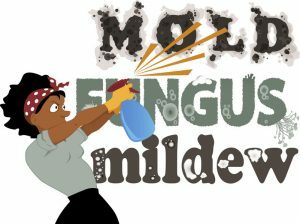 Both mold and mildew thrive in damp environments and omit foul odours. They do, however, have significant differences that help you to tell them apart. Mold needs moisture and warm temperatures to stay alive. This fungus will have a fuzzy appearance. It can range in colours from bright red, dark green, to black. It will be darker than mildew and can even resemble a patch of dirt. Mold can cause a reaction similar to the flu or allergies such as sneezing, rashes or a sore throat. Long term exposure in extreme cases can cause respiratory or heart issues. Mold penetrates surfaces making it difficult to clean and professional cleaning is usually recommended. Mildew is found in wet areas and has a flat or powdery appearance. It can be greyish-white, yellow or brownish-black in colour. Mildew grows flat on surfaces, and is usually found on shower curtains or window sills. This surface fungus is easy to clean – grab your cleaning gloves, a cleaning product and scrub it away. Prevention is key – be sure to keep your household surfaces clean and dry. For other rental tips, or to find your next apartment, visit our website at https://www.panadew.ca/available-rentals or check out our Facebook page for available rentals.